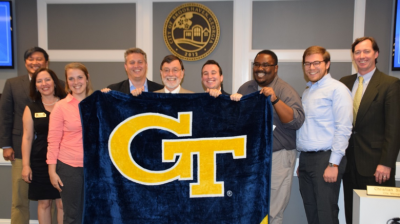 Brookhaven shows GT spirit at a recent City Council meeting. Brookhaven shows GT spirit at a recent City Council meeting. From left: Councilmember John Park, Councilmember Linley Jones, Kelsey Waidhas, Mayor John Ernst, Professor Gary Cornell, Ian Michael Rogers, Christopher McIntosh, Michael Smith and Councilmember Bates Mattison.